President of Tatarstan Rustem Minnikhanov and iCarnegie CEO Gil Taran signed a memorandum of understanding in Pittsburgh on Tuesday, an agreement which brings the subsidiary of Carnegie Mellon University one step closer in its bid to become a key education partner for the republic as it develops a new IT University in Innopolis. Under the agreement, iCarnegie will help Tatarstan develop “a world-class educational system” centered around the First Russian Information Technology University in Innopolis but also integrated with the republic’s school system and providing opportunities for professional training courses, according to a press release by the Tatarstan Ministry of Information and Communication. This IT University will form part of the core of Innopolis, a 155,000-person city that will be built in the suburbs of Kazan over a decade, creating 60,000 jobs in the republics IT sector in an audacious bid to become the leading IT hub of Russia. Founder of Parallels and senior partner at Runa Capital, Beloussov has played a key role in the development of Innopolis and in the developing role that iCarnegie is playing. In an interview with The Kazan Herald in July, Taran explained that it was Beloussov who initially introduced him to Russian Minister of Communication and Press Nikolai Nikiforov, who at the time was Tatarstan Minister of Information and Communication. Beloussov was also with Taran and an iCarnegie delegation during a visit to Moscow and Kazan in July, during which they met again with Nikiforov and were introduced to Minnikhanov and other Tatarstan officials for the first time. Beloussov likewise accompanied the Tatarstan delegation during the recent trip to Pittsburgh. Construction of the IT university and its campus is scheduled to be completed during Stage 1 (2012-2015) of the Innopolis master plan, which was finalized by Singaporean architect Liu Thai Ker in early August. According to the master plan, the IT university will be 50,000 square meters of space on a campus with a total area of 80,000 square meters. The university will have designed for a student body of 5,000 and will graduate roughly 1,000 IT undergraduates per year. According to the university’s website, its director of studies is Aleksandr Tormasov, who is currently chairman of the Computer Science department at Moscow Institute of Physics and Technology and also chief scientist at Parallels. The IT university’s administrative director is Dmitry Kondratyev. In July, Innopolis project manager Anton Grachev set the estimated cost for construction of the IT university and campus at roughly $300 million. In a video from a meeting between the Tatarstan delegation and iCarnegie, Minnikhanov noted that Beloussov and his network of contacts would play an important role in the success of the new IT university, as would iCarnegie. Minnikhanov suggested moving towards establishing concrete goals and reporting channels so that the new university would be operational in time for the 2013-2014 academic year. “I understand that this is a very short period of time, I understand that it is possible that not everything will happen on time, but we will start and see,” Minnikhanov said. The Tatarstan president added that he would use all resources available, including Kazan Federal University, to work towards this deadline. At the same time, however, Minnikhanov noted that the project would not be successful without federal support. “We must understand that this is a federal project,” Minnikhanov said, adding that support from Nikiforov and his federal Ministry would be crucial. 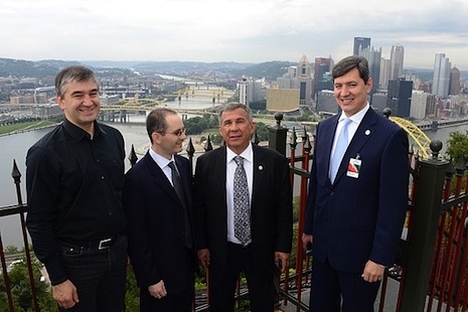 Nikiforov was not in Pittsburgh for the meeting and memorandum signing, but his Deputy Minister Mark Shmulevich was, as was Kazan Federal University Rector Ilshat Gafarov, Tatarstan Minister of Information and Communication Roman Shaykhutdinov, and Tatarstan trade representative to the United States Ravil Nigmetzyanov. During their time in Pittsburgh, the Tararstan delegation also met with Carnegie Mellon University Provost Mark Kamlet, who presented Minnikhanov with a key “to our friendship and collaboration,” and toured the university’s campus, including the Intelligent Workplace Lab and the Robotics Institute. According to Taran, iCarnegie is “proud” to have been given the opportunity to help Tatarstan develop the IT university. “Our path forward is to further investigate issues involved in determining the project scoe, timelines, and deliverables,” Taran explained in an email to The Kazan Herald, adding that it is likely that he will visit Kazan in the next two months to do a needs assessment of the regional and federal IT sector. First published in the Kazan Herald.